László Tőkés has served as Fidesz Member of the European Parliament (MEP) since 2014. Tőkés previously served as an MEP from Romania between 2007 and 2014. 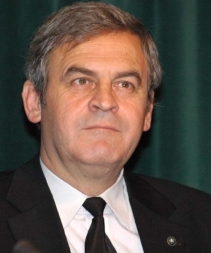 Tőkés, a member of the large Hungarian national minority living in Romania, chose to stand as a candidate in European Parliament elections in Hungary in 2014 rather than his native country after obtaining Hungarian citizenship in 2011. Tőkés became famous as the catalyst for the 1989 Romanian Revolution that overthrew communist dictator Nicolae Ceaușescu. Born and raised in the city of Kolozsvár (Cluj-Napoca), Romania. Graduated from the Protestant Theological Institute in Kolozsvár in 1975. Served as Reformed assistant pastor in Brassó (Brașov), Dés (Dej) and Temesvár (Timișoara) from 1975-1989, becoming a full pastor while working in the latter city. The resistance of Tőkés and his parishioners to the Ceaușescu régime’s attempt to forcibly remove him from his position in Temesvár triggered the Romanian Revolution of 1989. Served as Bishop of the Királyhágómellék Reformed Church District in Romania from 1990 until 2009. Was honorary president of the main Hungarian political party in Romania, the Democratic Union of Hungarians in Romania [Romániai Magyar Demokrata Szövetség], from 1990 until resigning from this position in 2003 after coming into conflict with the party leadership. Helped to established the Hungarian National Council of Transylvania (Erdélyi Magyar Nemzeti Tanács) in 2004. Has been the president of the latter organization, which advocates territorial autonomy for the Hungarians of Romania, since its foundation. Has served as guardian (védnök) of the National Council of Transylvania (Erdélyi Magyar Néppárt), the political party that emerged from the Hungarian National Council of Transylvania, since the party’s inception in December 2010. The National Council of Transylvania is widely considered to be a financial (source in Hungarian) and political (source in Hungarian) satellite of Fidesz. Appears annually alongside Viktor Orbán and other Fidesz officials at the Hungarian Tusványos Summer University and Student Camp held in Tusnádfürdő (Băile Tușnad), Romania. In November 2011, Prime Minister Viktor Orbán and Tőkés officially reconfirmed their alliance with regard to national strategic policy (source in Hungarian). Elected to serve as Member of European Parliament from Romania as independent in 2007 with the endorsement of Fidesz President Viktor Orbán (source in Hungarian). Reelected to European Parliament as joint National Council of Transylvania-Democratic Union of Hungarians in Romania candidate in 2009. Serves as honorary president of the 19-member Hungarian People’s Party Representative Group (Magyar Néppárti Képviselőcsoport) in the European Parliament composed of the 14 Fidesz MEPs as well as three MEPs of Hungarian nationality from Romania and two MEPs of Hungarian nationality from Slovakia (source in Hungarian). Became a Hungarian citizen in March 2011, taking his oath of citizenship in Kolozsvár in the presence of Orbán régime Deputy Prime Minister Zsolt Semjén (source in Hungarian). 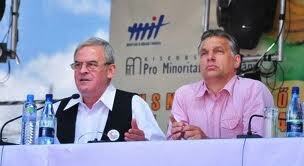 “We ask Prime Minister Viktor Orbán and the government he leads to build a system of national cooperation in such a way as to provide Transylvania with protectorate status as Austria did with South Tyrol.” July 27, 2013, speaking at the Tusványos Summer University and Student Camp in Tusnádfürdő (Băile Tușnad), Romania (source in Hungarian and source in Romanian).